Time to sit down for coffee with Chess King. Let’s find out how chess-alert are you. Here’s a neat position from the game Shurawlew – Semenjuk, Variante, 1976. White comes up with a nice to idea to win. Can you see how? 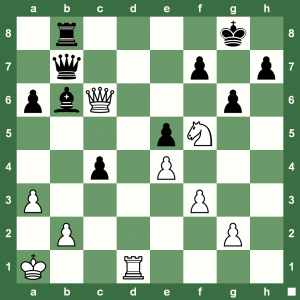 Click on diagram to see solution explained on the #1 chess tactics blog! I love Chess King puzzles and games. Good one there and yes, it is easy.